The number of pages viewed on this blog is about to pass 4,000. 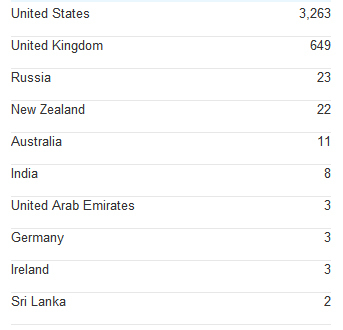 Judging from the location of my visitors (shown below), I need to learn some new languages. Can anyone out there speak Australian? Think it may require a Fosters or two. For a pair technophobes like us, the range of countries is astounding. All we can say is welcome, willkommen, bienvenue,dobro pozhalovat,swagat, and ayubowan to all of you. UAE??!! You are turning into an international brand! Will you be selling t-shirts soon? Just need to crack the Chinese market and you are set; actually, have them make the t-shirts while you are at it, I hear that they make some stuff nowadays. ytt. How do you not have any Spanish speaking countries represented? Talk Bill into sending me abroad again, and I'll hit you up from all over Latin and South America. G'day mate! Something about prawns and a barbie?